Saudi Arabia is one of the major consumers of solar panels in the Middle East region. Growth in Saudi Arabia solar panel market is buoyed by factors such as growing energy demand and shifting focus towards non oil sectors. Additionally, Saudi government aims to increase the share of cleaner fuel in country's power generation capacity. Solar panel market in Saudi Arabia would surge on account of growing investment in renewable energy sector of which major share would go into solar energy. According to 6Wresearch, Saudi Arabia Solar Panel market size is projected to grow at a CAGR of 30.2% during 2018-24. Saudi Arabia is likely to ramp up spending on renewable energy sector. Spending on solar energy is growing tremendously over the past few years. For instance, Saudi Arabia has signed a memorandum of understanding (MoU) with SoftBank Group to build world largest solar project of 200 GW worth $200 Billion by 2030, which would positively impact the solar panel market in coming years. Amongst all types, polycrystalline solar panel captured the significant Saudi Arabia Solar Panel Market share in terms of revenues and is expected to maintain market leadership over the forecast period as well. Commercial application was the key revenue generating application followed by Power Utility application in Saudi Arabia Solar Panel market. Key players in Saudi Arabia solar panel market include: First Solar, Canadian Solar, Jinko Solar, Trina Solar, GTek Solar, Desert Technologies. 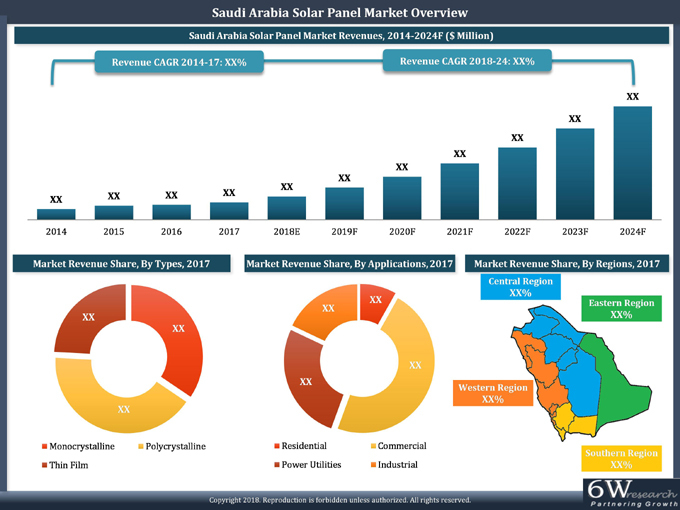 The Saudi Arabia Solar Panel Market Report thoroughly covers the Solar Panel market by types, applications and regions. The Saudi Arabia Solar Panel Market Outlook report provides the unbiased and detailed analysis of Saudi Arabia Solar Panel Market Trends, opportunities/high growth areas, market drivers which would help the stakeholders to device and align their market strategies according to the current and future market dynamics. • Historical Data of Saudi Arabia Solar Panel Market Revenues for the Period 2014-2017. • Market Size & Forecast of Saudi Arabia Solar Panel Market Revenues until 2024. • Historical Data of Saudi Arabia Solar Panel Market Revenues By Types for the Period 2014-2017. • Market Size & Forecast of Saudi Arabia Solar Panel Market Revenues By Types until 2024. • Historical Data of Saudi Arabia Solar Panel Market Revenues By Applications for the Period 2014-2017. • Market Size & Forecast of Saudi Arabia Solar Panel Market Revenues By Applications until 2024. • Historical Data of Saudi Arabia Solar Panel Market Revenues By Regions for the Period 2014-2017. • Saudi Arabia Solar Panel Market Trends and Developments. • Saudi Arabia Solar Panel Market Share, By Players. 13.5 Hanwha Q CELLS Co., Ltd.
13.10 Yingli Green Energy Holding Co., Ltd.